Nyt en underholdningskveld som er perfekt for hele familien under dette vietnamesiske vanndukkeshowet med middag i Ho Chi Minh-byen. Du vil oppleve en tradisjonell forestilling, komplett med orkestermusikk, mens du nyter smaken av tradisjonell lokal mat. Se som kunstnere spiller ut scener fra det daglige liv og kulturlegenden under dette unike showet. Very enjoyable and interesting night out. Originally dinner was supposed to be on a small riverboat, but the boat needed repairing so they had dinner at a different restaurant after the show. If you don't understand Vietnamese this show would be a little underwhelming. Its good for the theatrics but not completely enjoyable for 40 mins. The pickup service was timely and we were provided with great seats. Dinner was especially nice and there was plenty to eat and we were allowed to eat at our own pace. Would definitely recommend this tour for anyone in Ho Chi Minh City. 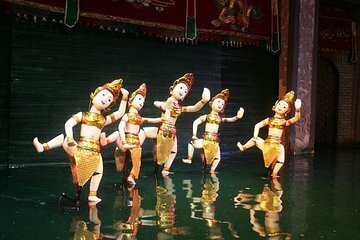 The show was well produced and some of the puppets we was trying to work out how they controlled them in the water. I can see why the puppet show has received rewards. The show was carried out in Vietnamese. It would of been nice to have something to tell you a bit of the story you are watching in English. The show was worth a big tick in the box on doing when here. This is an amazing show the work that goes into the puppet show,is first class well done to all. Dinner was delicious. Puppet show was a little disappointing. This was a great tour. Our tour guide - En picked us up in a nice vehicle and drove us to the puppet show, helped us find our seats and then took us to the dinner at The Chateau where we had a multi course dinner and then back to the hotel. Only thing I thought was strange was that no drink was included for the dinner - not even bottled water. If not interested in the dinner, I would book your own tickets, take a cab to and from your hotel. Puppet show is very different and certainly something to see.